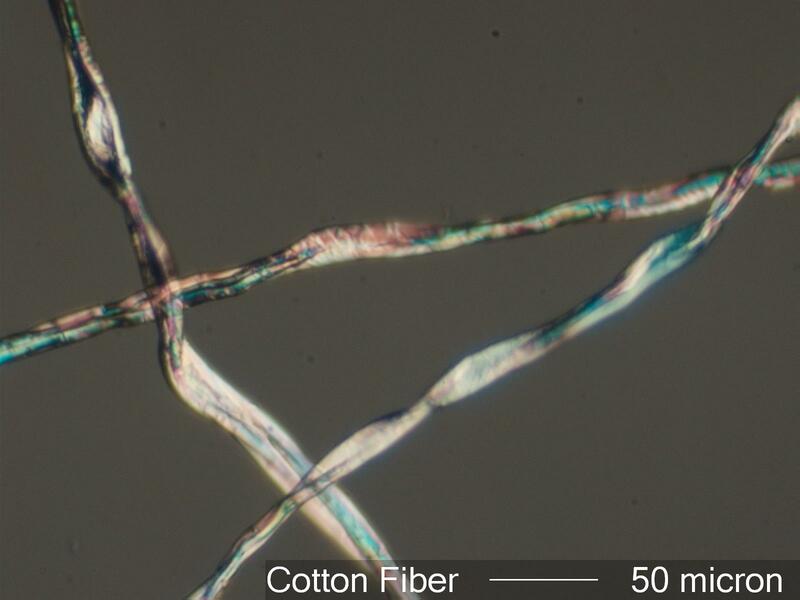 The apparent twist in these fibers is typical of cotton. A unique optical property of cotton is its lack of an extinction position. As the stage is rotated between crossed linear polarizing filters the fiber's brightness doesn't significantly change. Cotton is a very common clothing and bedding fiber. Hospital gowns, lab coats, and other company or facility provided outer garments are offen made of cotton. Free cotton fibers are very common in bedroom samples and in hospital and laboratory environments. It is also the main fiber in common shop rags. When cotton is mercerized the twist is greatly reduced and the fiber tends to darken significantly on rotation between crossed linear polarizers.